When Jessica, a grieving widow, inherits an antique mall from her mother she also inherits the stallholders, an elderly, amoral, acquisitive, and paranoid collection. When one of the vendors, a wily ex-con named Roxy, shoots her ex-husband, she calls on Jessica to help bury the body and soon Jessica is embroiled in cover-ups, lies, and misdirection. Into this mix comes Lizzie, Jessica's late husband's twelve-year-old daughter by his first marriage, who's been dumped on Jessica's doorstep by the child's self-absorbed mother and it soon becomes apparent that Lizzie is as obsessed with material possessions as Jessica's elderly tenants. 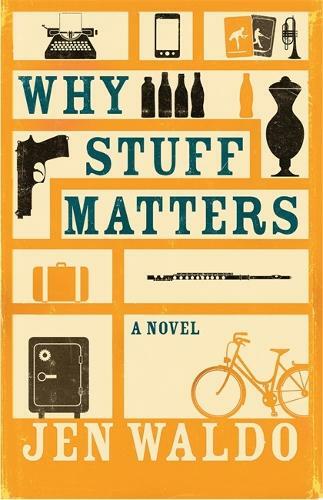 Why Stuff Matters is a compelling ode to possession, why people like things and the curious lengths they will go to keep them. Returning to her fictional Caprock, Waldo turns her wry wit on the lives of those afraid to let go.